Cambridge United fans thought they were dreaming when one of England's greatest ever footballers agreed to grace their little ground. He has been called the best inside forward England has ever produced. He was the Golden Boy who brightened pre- and post-war Britain with dazzling displays of ball mastery. He could, said Stanley Matthews, make the ball talk. And for two incredible seasons in the 1950s he played in the humble surroundings of Cambridge United’s Newmarket Road ground. 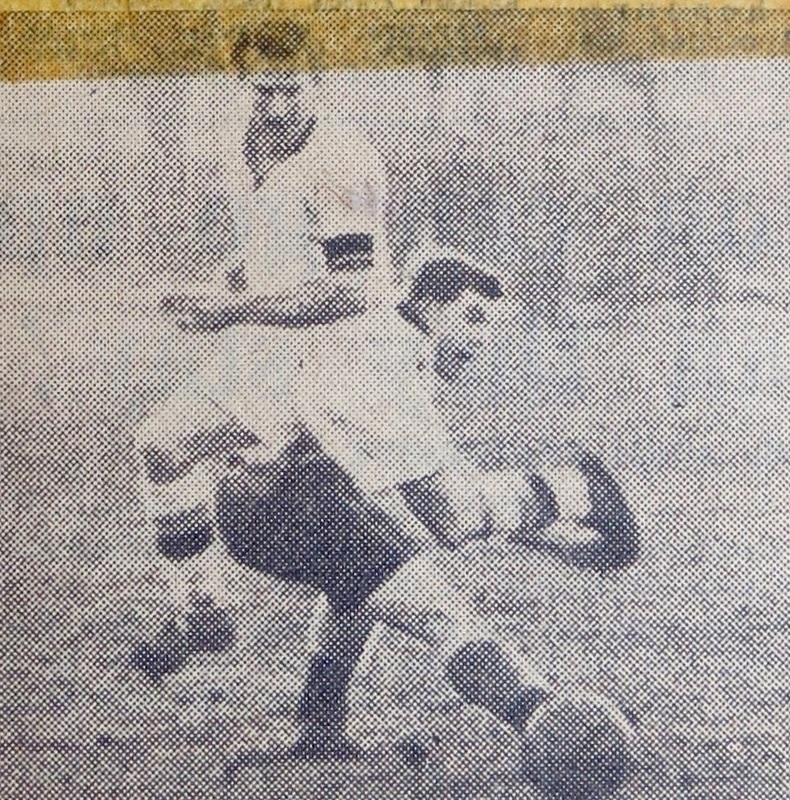 Above, Wilf Mannion skips past a defender on his home Eastern Counties League debut against Bury Town on 23 August 1956. The U's won 5-3 in front of 4,100 spectators. 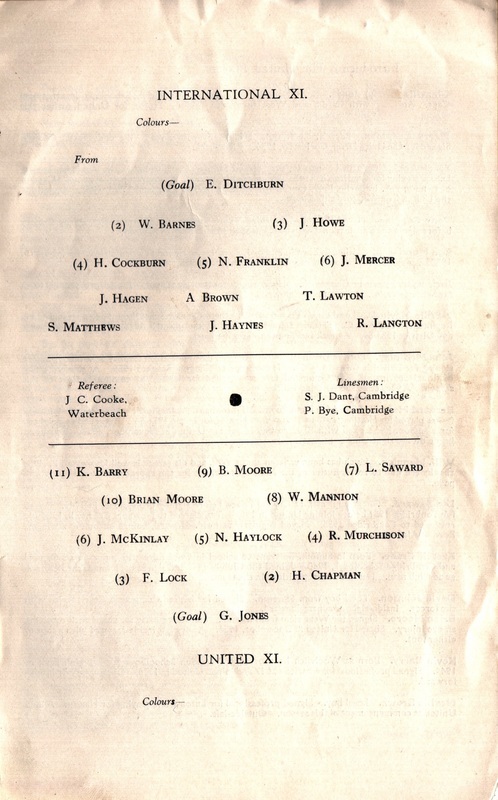 Top, the starry line-ups for Mannion's benefit match on 19 March 1958 – see programme below. 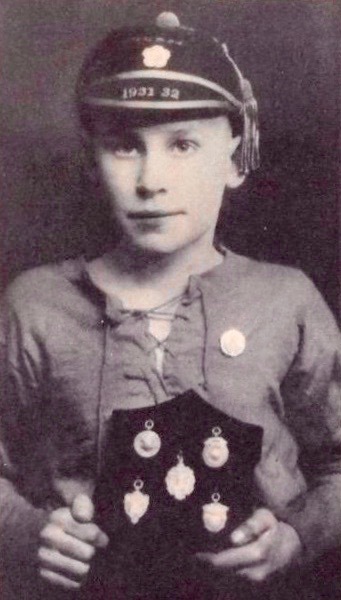 Wilf Mannion left, as a child star; above, at his peak; right, remembered in a statue at Middlesbrough's Riverside. was playing for an amateur team while carrying on his job at the steelworks that he’d started when he was 14. His genius was noticed and, having signed for Middlesbrough, he was paid £3 10s a week plus a £3 first-team win bonus. The fair-haired young man, diminutive but good-looking, made his first-team bow in January 1937 and was soon being called Golden Boy. Then came military service and the war. 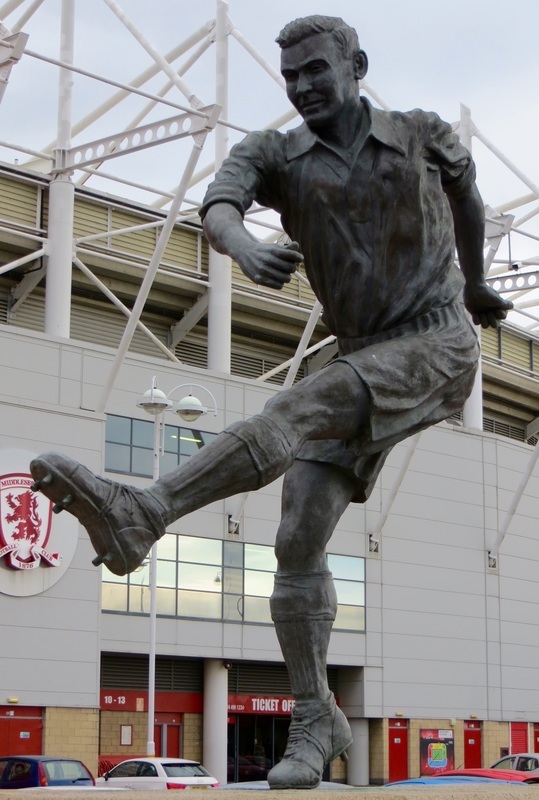 After surviving action in France, Sicily and the Middle East – and missing seven years of his football career – Mannion returned to Middlesbrough at the peak of his powers. He would eventually complete 368 appearances for his hometown club, scoring 110 times, while starring for England in 26 games. Three of his 11 international goals came on his debut against Northern Ireland in 1946, and in 1948 he was inspirational as England beat Italy 4-0 in Turin. But his stellar career didn’t always proceed smoothly. Mannion was not afraid to stand up for what he thought right, and he didn’t hesitate to take on the football establishment and its dogged adherence to a transfer system that effectively chained players to their clubs. At the end of the 1947/48 season, when his weekly wage was the maximum £12, he asked Middlesbrough for a transfer to Oldham but the club scuppered the move by placing a ludicrous fee on his head. Chairman David Jack declared: ‘Even if a club came to us with a cheque for £50,000, we would not transfer Mannion. Why should we let the best player in Britain go?’ Mannion went on strike, sold chicken coops to earn a living and missed six months of football. 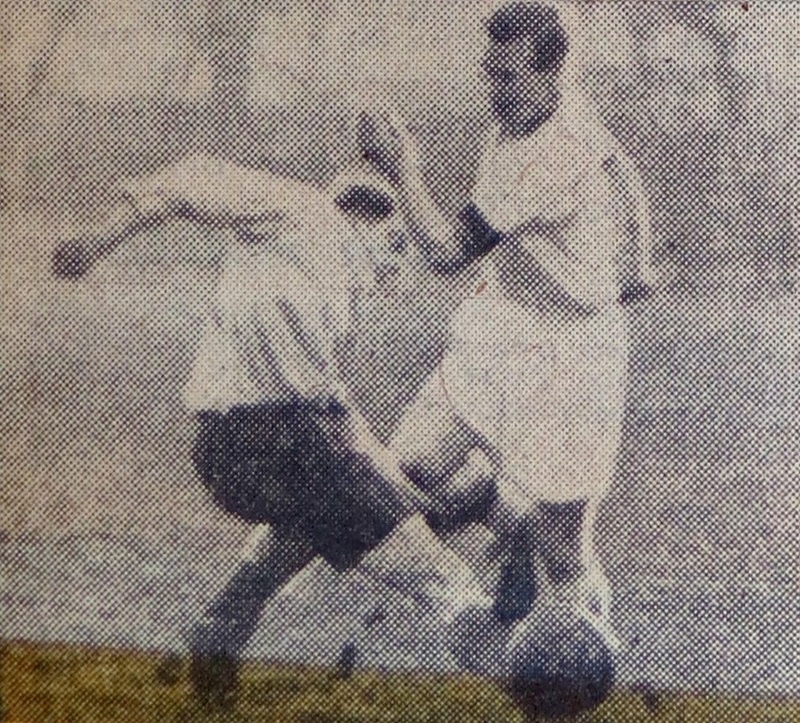 Club and player eventually made peace in early 1949 and he played on until 1954, when he first retired, then put on his boots again to play for Hull City. But trouble was brewing again: the Football League demanded he name names after he made allegations of illegal payments in his newspaper column. Mannion refused. The result: he was banned from League football. This was to the immediate benefit of non-League Poole Town and then, in the summer of 1956 – a year after manager Bert Johnson had first tried to lure him to Newmarket Road – the U’s. It was probably a bit like Lionel Messi signing for Soham Town Rangers. By then Mannion was 38 and obviously past his best, but that didn’t diminish the incredible effect his arrival had on club, players, fans and city. More than 4,000 incredulous spectators turned out for his home debut on August 23. Despite his advancing years, the genial, unassuming Mannion retained the mesmeric skills that had made him a household name: the swerves and sidesteps, the feints and dummies, the killer passes, the uncanny knack of always being available to receive the ball. All this was more than adequate reward for the £15 a week United paid him. Like a lot of us kids up Newmarket Road in the 50s and 60s, I didn’t make it: an also-ran. 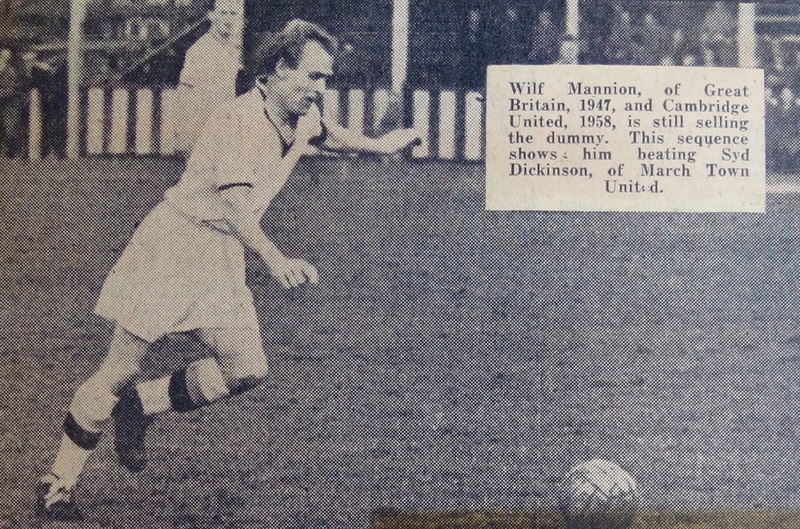 However, what a thrill we had when, in training, we got to nearly tackle Wilf Mannion, aka the Golden Boy. Matthews, Mannion, Lofthouse, Mortensen, Finney – pow! With his England teammates this guy had played on the best grounds in the world, yet when he was at United he changed in a hut, with a few rodents in the boiler house. I can see him now with a stainless steel pail full of cold water, sluicing himself down – we had no shower. If only I had nicked that pail and replaced it with another: it could have graced United’s museum. 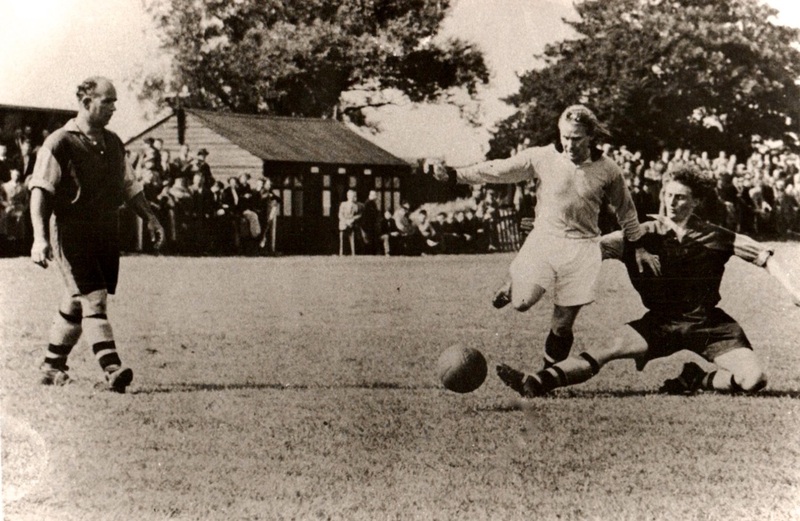 Wilf was undoubtedly the most famous footballer to have played in Cambridge. He was also one of the most modest, and of course most skilful, stars to have graced Newmarket Road. Not long after making his United debut against Holbeach on 18 August 1956, and a spell out injured, he found himself in the company of Brian Moore, a former West Ham forward whose League career had been cut short by an eye injury. 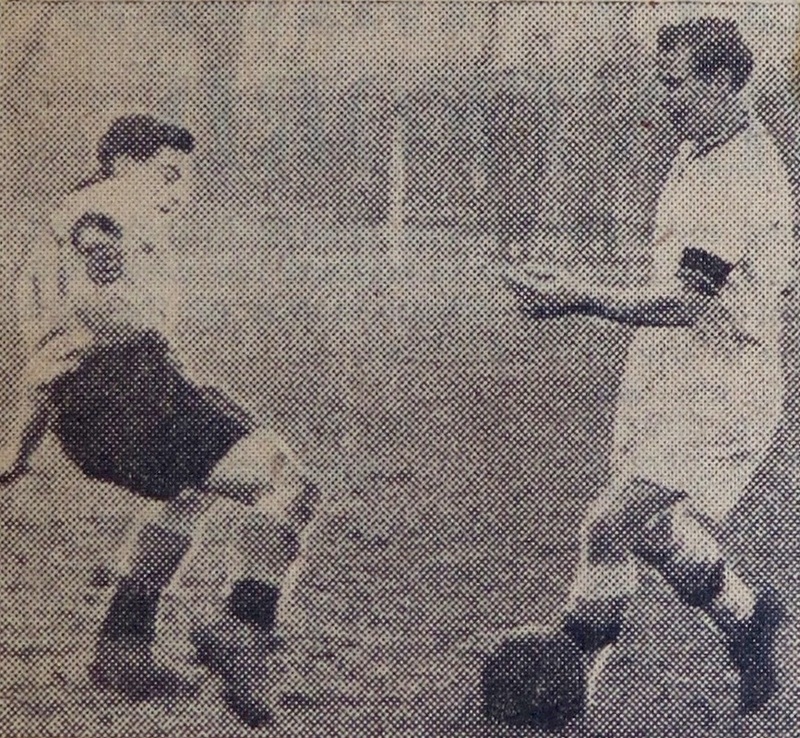 Mannion had been Moore’s childhood idol and he was eager to play with the master – an ambition he realised in November 1956. The pair formed an almost unstoppable partnership, with Moore scoring a record 68 goals in 1957/58 as United finished as ECL runners-up. 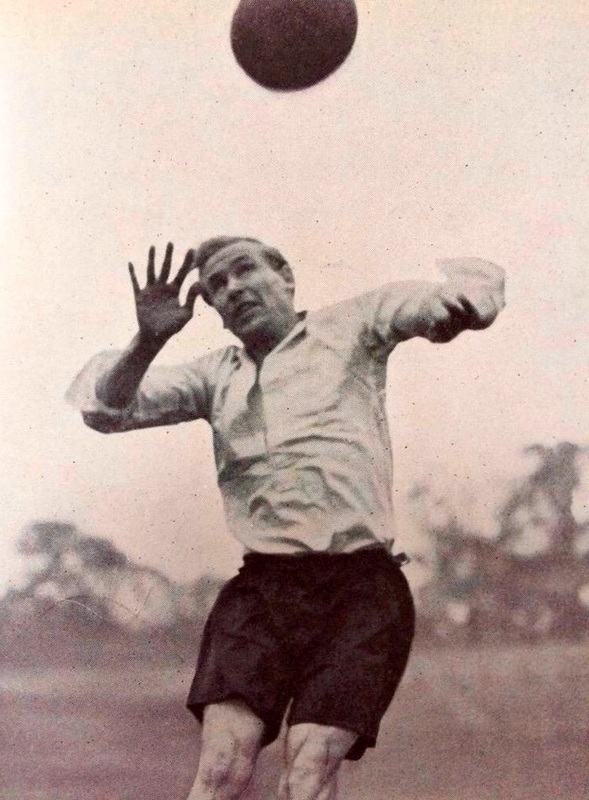 Mannion scored 23 goals in the 75 appearances he made in his two years at the Abbey. 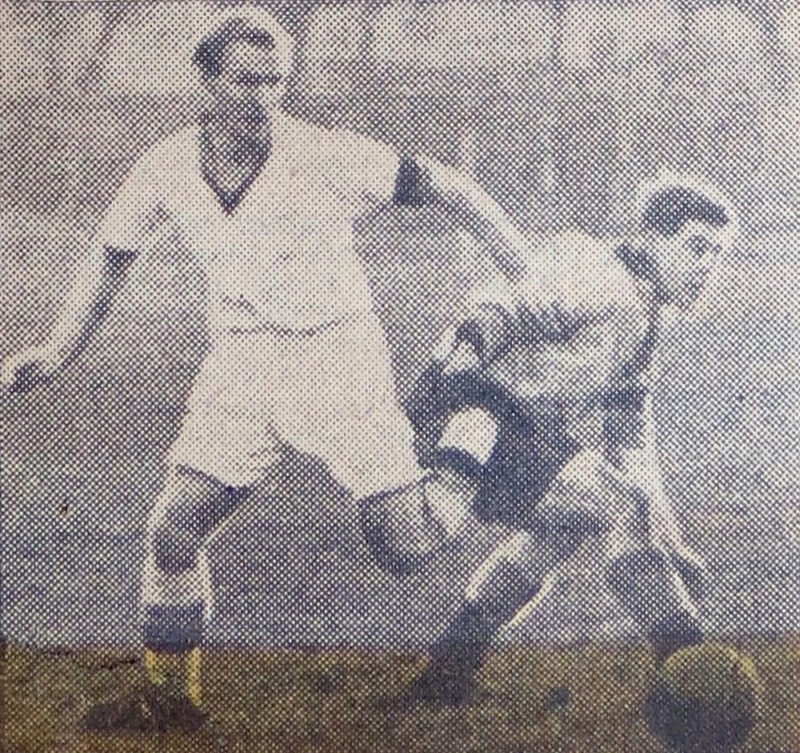 His last competitive game for the U’s was at Wisbech in the Cambs Invitation Cup on 7 April 1958. A couple of weeks earlier, a cluster of stars of the football firmament, and 9,500 spectators, had turned out for his testimonial match – something that Middlesbrough had denied him. 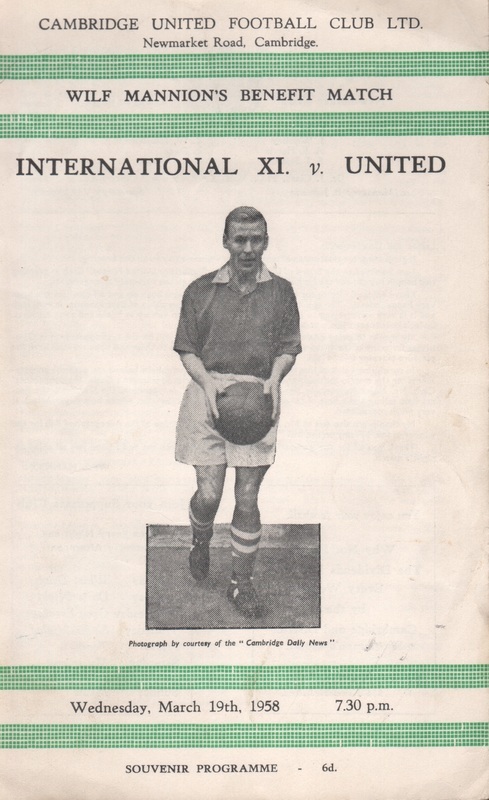 The likes of Stan Mortensen and Ted Ditchburn had played for an International XI on that occasion, and the stars were out again on April 14 for an exhibition match in which Mannion made his last appearance in United colours. But he wasn’t quite finished at the Abbey: he returned in March 1959 to honour old colleague Bob Bishop at his testimonial. Having hung up his boots, he tried his hand at management – of a pub in Stevenage and of the football clubs of King’s Lynn and Earlestown – but they were short-lived jobs. Mannion returned to the north-east, where his legendary status was undiminished, and where he died, aged 81, on 14 April 2000. He had been the greatest player in the history of two very different clubs.